This article is about the series of sketches. For the musical based on the sketches, see Acorn Antiques The Musical. Julie Walters (Mrs Overall), Victoria Wood (Berta), Rosie Collins (Trixie) and Celia Imrie (Miss Babs) in Acorn Antiques (1986). Acorn Antiques is a parodic soap opera written by Victoria Wood as a regular feature in the two seasons of Victoria Wood As Seen On TV, which ran from 1985 to 1987. It was turned into a musical by Wood, opening in 2005. Wood originally wrote Acorn Antiques as a weekly slot in her sketch shows Victoria Wood As Seen On TV. She based it on the long-running ATV/Central serial Crossroads (1964-1988), and radio soap Waggoners' Walk (1969-1980). Swipes were also taken at current soaps such as EastEnders and Coronation Street with their apparent low production values, wobbly sets, overacting, appalling dialogue and wildly improbable plots. Its premise—the lives and loves of the staff of an antiques shop in a fictional English town called Manchesterford—hardly reflects the ambitious and implausible storylines, which lampooned the staples of soap operas: love triangles, amnesiacs, sudden deaths and siblings reunited. It also satirised the shortcomings of long-running dramas produced on small budgets with its little artificial-looking set, missed cues, crude camera work and hasty scripts. A lack of continuity is seen in distinct lapses where storylines are introduced and dropped between episodes and character development is forgotten. One episode, for example, is introduced as reflecting the current interest in health fads with a plot where the antiques shop is merged into a "Leisure centre and sunbed centre", never to be mentioned again. This story-line also reflected changes in the Crossroads storyline in the mid-1980s as a leisure centre opened at the motel, which was the setting of the serial. The deliberately haphazard opening and end credits, together with its tinny title music, also lampooned Crossroads. The opening sequence was updated for the second series, with a reworking of the theme tune and shots of Miss Babs, one of the leading characters, driving to Acorn Antiques in the firm's van. This too was reflective of changes in the Crossroads series at the time, as the show gained its first filmed opening sequence. Another nod to changes in the mid-1980s Crossroads opening sequence was the inclusion in one episode of Acorn Antiques of vertical window blinds, with the show's title written on them. Predictably, the Acorn Antiques version did not work and had to be pushed aside by hand. Perhaps the most comical element of Acorn Antiques were the missed cues, harking back to the days when Crossroads was recorded live. Fictional floor managers and directors can be heard prompting the dreadful actors to say their lines, whilst the end of several scenes show the actors not quite knowing what to do with themselves while the camera is still rolling. Wood also created a spoof arts documentary about the show for her As Seen on TV special, in keeping with similar straight-faced "behind-the-scenes" shows produced about soap operas, which revealed the shambolic production of Acorn Antiques being put together, and interviewed the self-obsessed fictional actors behind the fictional characters. At one point, when an obvious continuity error is pointed out, the hard-nosed producer "Marion Clune" (played by Maggie Steed) summed up the directorial attitude: "We professionals notice - Joe Public never clocks a darn thing." The documentary also depicted the actress portraying the drudge Mrs. Overall as being an archetypal soap diva called Bo Beaumont (although in the series the fictional end titles credit Julie Walters as Mrs Overall). The sketches even led to a fanzine and appreciation gatherings where fans would dress up as the characters. In 2004, in a poll on its website, Channel 4 voted Acorn Antiques the 7th best comedy sketch of all time. The show made a brief return to television in 1992 in Victoria Wood's All Day Breakfast, her satire on daytime television. 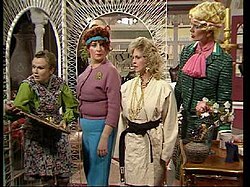 A sketch of its soap, The Mall, ends with Mrs Overall returning to reopen Acorn Antiques, mentioning that the other principal characters had been killed in a bus crash (even though she herself had been killed off in the final episode of the original series). A special one off episode was broadcast in 1996 in a programme to commemorate 60 years of BBC Television. One final sketch was shown in 2001 with the original cast and Nick Frost as an armed robber (as part of Wood's History of Sketch Comedy BBC1 series). Think On and Look Sharp Series 1, Episode 1 Things come in threes: one death, one break up, and one coffee without a sweetener. Shot in Dakar Series 1, Episode 2 Shop co-owner Berta returns from intensive care to find that her father is still alive. Trixie Trouble Series 1, Episode 3 Shop worker Trixie causes trouble when she finds out that she is Babs' daughter. Cousin Jerez Series 1, Episode 4 Cousin Jerez sparks a suspicious interest in Acorn Antiques. Muesli Series 1, Episode 5 Clifford reveals that he and Berta are married. Twins Series 1, Episode 6 Mrs Overall finds out that she is mother of both Derek and Miss Berta. Up For Sale Series 2, Episode 1 Miss Babs decides to put Acorn Antiques up for sale. All's Well That Ends Well Series 2, Episode 2 Mrs Overall reveals that she never posted the letter to the estate agent. Drastic Refurbishment Series 2, Episode 3 The shop begins its refurbishment. Health and Fitness Series 2, Episode 4 Acorn Antiques is turned into a Leisure Centre. Shocking News Series 2, Episode 5 Clifford reveals a secret about him and Derek. The Final Performance Series 2, Episode 6 Mrs Overall and Clifford die. Main article: Acorn Antiques: The Musical! In 2005 Victoria Wood created a musical version with Julie Walters, Celia Imrie and other members of the original cast, the role of Mrs Overall being alternated between Julie Walters and Wood. The original run was directed by Trevor Nunn and had a sellout season in the West End. It earned several Olivier Award nominations, and Celia Imrie won the award for Best Supporting Actress in a Musical. It was revived on tour in 2007, directed this time by Victoria Wood herself. The Crescent Theatre in Birmingham presented the premiere of the first amateur production of the show in May 2010. The Leighton Masqueraders became the second amateur drama group to put on a production of the show later in 2010. Richard and Thomas Ayre are listed as lighting operators, and Victoria Wood attended the opening night. Wigston Amateur Operatic Society put on their production of the show in May 2016 at The Little Theatre in Leicester. Miss Babs (Celia Imrie): the overwrought and lovelorn owner of Acorn Antiques, who moves from one 'crisis' to another. Opens each episode on the phone introducing a never again mentioned plot line. Wife of Mr Kenneth, who was himself never seen on screen, mother of unnamed triplets afflicted with "dangerously straight hair" (and, we discover in one episode, Trixie Trouble), the triplets are kept amused by trips in the Wolseley, Get Carter at the cinema and bedtime stories by Simone de Beauvoir. Miss Babs' torrid romances are hinted at but never seen: Mr Clifford once abandoned her by the handbags in a well-known store. Distinguishing features include a birthmark shaped like a moped. Her humanitarian credentials are revealed when she allows Mrs Overall a couple of hours off to attend her husband's funeral, provided she pops back at five for the hoovering. Miss Berta (Victoria Wood): a partner in the business who begins the series emerging from intensive care to discover that her deceased father (believed murdered in Dakar) has been seen buying a padded envelope in the post office. She later develops amnesia and gets married to Clifford (the Bishop of Manchesterford officiating) before discovering that she is not only the twin sister of Derek, but also the daughter of Mrs Overall, and the mother of an unnamed baby. In the musical version, Berta is revealed to be Babs's sister: both siblings are the daughters of Mrs Overall. Clifford (Duncan Preston): the stolid, reliable leading man whose advances are rejected by Babs. Shortly afterward he reveals he has married Miss Berta who is suffering from amnesia. Mr Clifford's voice mirrors that of David Hunter, sometime shareholder of the Crossroads Motel. He has a jet-setting lifestyle: "Bored with Zurich or did Zurich get bored with you?" asks Miss Babs. In the series he is electrocuted whilst unplugging an iron. In the musical, it is revealed that Mr Clifford's father knew of the paternity of the triplets, since he had sheltered the pregnant Mrs Overall, one rainy night. Mrs Overall (Julie Walters): the elderly tea lady, who believes all problems could be solved with a nice cup of tea, a macaroon and an anecdote. One of her many specialities is home-made sherry served in a mug. Her late husband referred to her as Boadicea. Asked why, she confesses, "He was barmy, Miss Babs". She is revealed to be the sole beneficiary of Berta's father's will, and mother of Miss Berta and Derek. The rather grand actress who "plays" Mrs Overall (Bo Beaumont) was a former lover of Lord Delfont. [clarification needed] In the series she dies after choking on her own macaroon. According to Wood, the character of Mrs Overall was inspired by Mrs Mack in Take the High Road (overall being a deliberate pun on mac) and Amy Turtle in Crossroads (originally played by Ann George who was born in the same town that Walters spent her early years, Smethwick). Trixie (Rosie Collins): also known as Trixie Trouble, a feisty, tarty femme fatale who works in the antiques packing department until she discovers she is Miss Babs' daughter. After her off-screen marriage to Bobby she mentions having had jaundice, 'lots of' extramarital relationships (which may have included Derek, with whom she was in a car crash), and is seduced by her mother's cousin Jerez, shortly before she briefly runs away to Morocco with Derek. She also had a romantic interlude at the Formica Motel with Mr Kenneth, who gave her a leotard and a wet-look bra. She returns to become a nun, and later a mother superior. Cousin Jerez (Peter Ellis): the foreign villain of the series, and previously unmentioned Spanish cousin of Miss Babs, who makes a rejected offer to buy the shop. Undaunted he disguises himself as a postman (whose signature whistle is the theme to Limelight) to misdirect mail which would have warned Babs of a new motorway to be built nearby. His plans are thwarted by Clifford but not before he has attempted to seduce Trixie. He later returns, completely reformed, while on his way to begin a sandwich course in computer studies at Fuengirola Polytechnic, and gives Babs £25,000, thus conveniently solving a cash flow problem at the shop. Extras (Albert Welch & Michaela Welch): the only customers to appear in the entire series. An elderly couple who appear at the beginning of every episode, looking at an antique and leaving the shop. A DVD containing Acorn Antiques as an individual release was made available in a 20th Anniversary Collection on 7 February 2005. Acorn Antiques was released as part of the complete series of Victora Wood: As Seen on TV on 2 April 2007. ^ "Waggoners Walk". Archived from the original on 2009-10-25. ^ a b "BBC Suffolk interview with Victoria Wood". BBC. 2007-03-11. Retrieved 2007-09-13. ^ Brandwood, Neil (2002). Victoria Wood: The Biography. London: Boxtree. ISBN 1-85227-982-6. ^ "50 Greatest Comedy Sketches". Channel 4. Archived from the original on 12 October 2007. Retrieved 2007-09-15. ^ "search.com - Acorn Antiques". search.com. 2007-08-28. ^ "thoughtworthy.com - Nick Frost". BBC News. 2007-08-28. Archived from the original on 2007-09-27. ^ "TV star Victoria Wood at Leighton Buzzard Show Premiere". Leighton Buzzard Observer. Archived from the original on 19 July 2011. Retrieved 2011-08-12. ^ "Swingers and Roundabouts - Interview with Kenny Ireland". Scotland On Sunday. 2007-03-15. Archived from the original on 2007-02-25. Retrieved 2007-09-10. ^ "Acorn Antiques". Amazon.co.uk. Retrieved March 10, 2015. ^ "Victoria Wood - As Seen on TV". Amazon.co.uk. Retrieved March 10, 2015.